With all of the radioactive material dropped in the sewers over the many generations has finally caught up to this modern city. Now the sewers and underground tunnels are infested with alien and mutant creatures. The mayor has given you funds to upgrade your guns and turrets, bots and weapons, and barred sewer grates to prevent the monsters from reaching the surface! 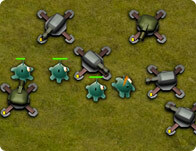 Use your mouse to aim and shoot the encroaching mutants.